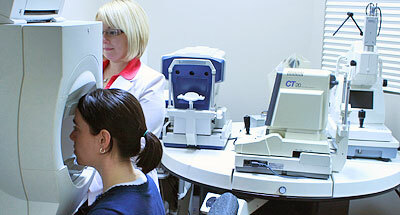 The ELMWOOD optometry clinic is equipped with cutting-edge technology for reliable, accurate diagnoses. Even if you don't have any signs or symptoms, an eye examination is the only way to determine if your eyes are actually healthy. Diagnosis of vision defects such as myopia, hypermetropia, astigmatism, presbyopia, strabismus, and convergence insufficiency. Prescribing ophthalmic lenses and sunglasses. Prescribing and adjusting contact lenses: spherical, toric, bifocal, disposable and regular, soft, and semi-rigid. Screening for eye diseases such as conjunctivitis, cataracts, diabetic retinopathy, glaucoma, uveitis, macular degeneration, retinal detachment, retinitis pigmentosa, inflammation of the eye, tumors and other conditions. Eye emergencies: Whether for eye redness, a foreign body in the eye, eye pain, dark specks, or flashes of light, we make a point of seeing you as quickly as possible. Just call the clinic to arrange for an appointment. 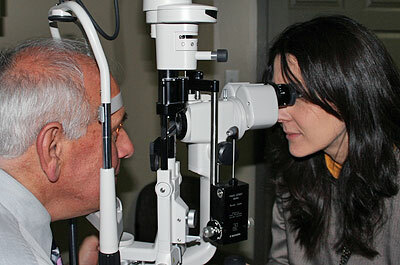 Post-operative management: We can provide appropriate follow-up after laser or cataract surgery. Patient management: We perform follow-up for our patients with certain systemic diseases, such as diabetes, and certain eye diseases, such as cataracts, glaucoma, and macular degeneration. When required, we can forward a detailed report of your vision health to your family doctor. Should a situation arise requiring the expertise of an ophthalmologist, the appropriate referral will be done. On-Site Laboratory: Never without my eyeglasses! Well, yes, that's possible. 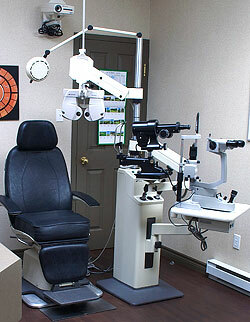 Make an appointment with our technician: we will cut, grind, and polish your lenses and give you your eyeglasses back. Protective eyewear: We provide comprehensive services for protective eyewear, which is often required by employers. We can advise you in selecting a pair of eyeglasses that best suits your work or simply provides eye protection when you perform certain jobs around the house. Our clinic is equipped with cutting-edge technology for accurate, reliable diagnoses. Optomap® retinal examination: This brand-new instrument takes a 200° image of the retina, which is the fundamental structure essential to vision. This image enables us to better assess your eye health and, in certain cases, even your overall health (conditions such as diabetes). Computerized visual-field test: This instrument assesses your visual field in different ways, which yields additional information about the health of your eyes, specifically in screening for diseases such as glaucoma. The electronic refractometer / keratometer assesses one aspect of your vision (myopia, astigmatism, hypermetropia). It provides highly accurate measurement of the curvature of the cornea, which is useful in fitting contact lenses or assessing cornea injury. Tonometer: This instrument measures intraocular pressure, which is important in assessing the extent of diseases such as glaucoma. Pachymeter: This instrument, which measures corneal thickness, enables us to better assess intraocular pressure and to more effectively screen candidates for laser surgery. The binocular indirect ophthalmoscope assesses a very large portion of the retina, requiring that the pupil be dilated. This test is used for people with diabetes, severe myopia, symptoms of retinal detachment, and any other symptoms that appear to involve the retina. Biomicroscope: This instrument makes it possible to perform highly precise examinations of the eye's external structure to assess conjunctivitis, scratches or foreign bodies on the cornea, inflammation, contact-lens fitting, and so on.